It's no secret that on the whole I found Dragon Age 2's (DA2) level design to be sorely lacking. From my perspsective, it's one of the areas where it really shows that DA2 was forced out of the door before it truly ready. The first major flaw is Kirkwall itself. It's a remarkably tidy city by any standards. You barely see any litter in the streets or bits of trash as you wander around. It obviously is home to the most diligent cleaners in the history of Thedas - and probably even puts modern cities to shame in most cases. This is a lack of "trash detail" that pervades much of the game. Places get dirty unless they are cleaned, and this should occur to some degree even in the utopia that is a fantasy world in a computer game. It doesn't need to be brown and mucky everywhere (as would likely be realistic), but there needs to be some mess, otherwise it's simply not believable. Kirkwall's second problem is the fact that it doesn't change. DA2 takes place over 10 years, yet Kirkwall is almost static in appearance during that time. No new buildings are made, none fall into disrepair, the same tiles are missing in the stone walkways, the same cracks exist in building walls. While it would not be intelligent (or feasible) to redesign the city repeatedly each time a few years advance during the story, the fact that virtually nothing changes is utterly ridiculous. This is particularly the case after the second act, where the city is home to a full-blown conflict in the streets. Yet a few years later when the story resumes, the city has been rebuilt to an identical match of its former state. This is sheer laziness in terms of level design, and does not lend credibility to the narrative at all. Good level design should help tell the story of a location just as much as words should, so to flagrantly disregard this opportunity and to disrespect the storytelling of the game is a hideous shortcoming. The poor quarter was rebuilt perfectly back the way it was? Seriously? 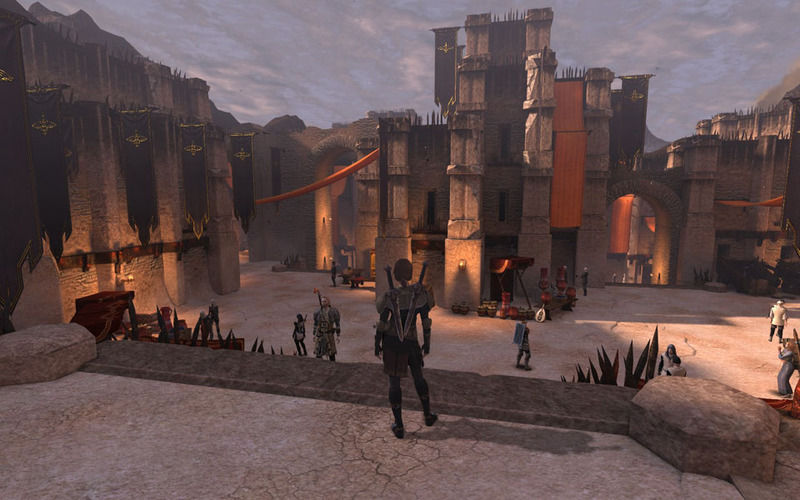 The third, and most commented on issue by DA2's critics in terms of level design, is the gross amount of level reuse present within the game. There are a few stock areas that you travel maybe a dozen times in the game, perhaps with different sections blocked off here and there, maybe sometimes in the other direction, but most distinctly copied and pasted wholesale. When part of the critical plot of a game sees you go through and area you've already explored several times before as part of a random cave, the impact of the story and the sense of adventure are all but lost. 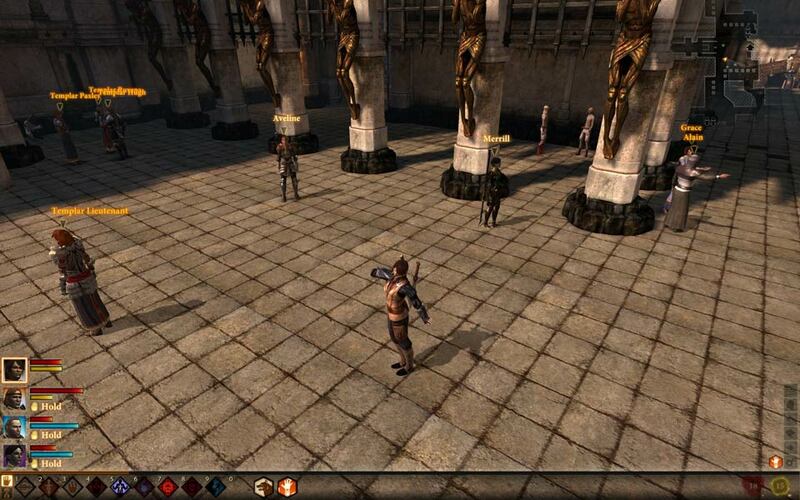 This is without doubt one of the most telling indictments that DA2 simply wasn't given enough time to be developed. No, level design is not everything, but to come up short in such an obvious fashion that is terribly grating to the player is either a sign of a rushed product, or design staff who simply didn't understand the gravity of the problem for the player. I'd hope it was the former rather than the latter. However, the news isn't all bad, so I do want to finish with one "good news story" that came out of DA2: Sundermount. This section of the game, or rather, the exterior areas (because the internals are part of the set levels used ad-nauseum) of it, are one of the highlights of the level design. Of course, there's the natural draw of "mountains are pretty", but while Sundermount does succeed aesthetically in providing good visuals, part of this is due to the technical design. Simply put, it reuses existing level design properly - it uses it as backdrop. The foothills of the mountain and the lower parts can all be seen as part of the vista that you can survey as you climb. This is intelligent area reuse, as it not only provides a sense of achievement (because you've climbed those bits before), but also helps to contextualise the player's position and current progress. So the news isn't all bad for Dragon Age 2 on the level design front, but unfortunately it tells us far more about level design through what it does wrong than by what it does right. If there's interest, I might try and put together a few points about when, where and how to reuse levels in a way that's less jarring to players. Sometimes life gets in the way of modding. Between work, social, musical and exercise commitments, not mention the daily routine of making sure I'm eating well and not living in a pig-sty, things have to fall off my to-do list. Blogging tends to be the first cap off the rank there, hence why I've been a bit quiet of late. This is not to say that I haven't been thinking about game design or doing modding. So when life gets in the way and I can't sit down for a long stint at the computer to mod for The Shattered War, I need small tasks that I can complete in short bursts. So this is where it comes down to leaving "the little things" in a list to come back to when I have 15-30 minutes to spare rather than an hour or more. First item on this list is processing VO lines that have been sent from voice actors. The first step here is to make sure the volume is consistent with all other lines in the mod. Sometimes this means decreasing the volume of the recording, other times increasing it, and other times I may need to do both to increase or decrease the overall volume range of the line. Once this is done, there's frequently a soft pop or tongue click that's not very audible by default, but would be in the final delivery. Then there's clipping or inserting silence at the beginning or end of each line to make sure that each line isn't just running into the next one. The next item is codex entries, and this is an important one for me. I know some people will never check the codex once to check out the backstory of people, places or items, but for me this is a vital part of the modding process. 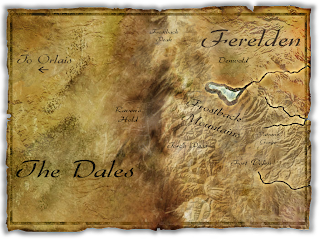 Sure, I'm playing within the existing world of Thedas, but I'm exploring territory not really covered elsewhere, so I have a little freedom to provide background on the locations the player will visit. Every place has its own unique tales and pieces of folklore, and locations in The Shattered War are no different. The same applies to characters the players will meet, and the unique items they could acquire. More recently, I've been looking at the various bits of text you read during load screens. Whether it's an area transition or loading a save, players deserve to see bits of information relevant to their current adventure rather than just generic bits of information recycled from the core campaign. I want to make sure that players aren't disappointed when they are waiting on those loading screens and have something new and interesting to read. Some of these are "little things" that many players (and modders) are often less fussed about, but I'm keen to make sure that these small touches of polish are present to make The Shattered War a more complete gaming experience. Are there any other things in this vein that players appreciate? If so, let me know those little things which really appeal to your sense of enjoyment and engagement. One issue I constantly battle with in the design of The Shattered War is how much to help the player and hand-hold their experience. This struggle comes due to many of the modern conveniences of current video games and the way they make things just "that little bit easier" for the player. While this might seem a somewhat trivial issue to ponder, the amount of help or assistance given to a player is a very important design consideration. A few simple tweaks can take a game that frustrates the player because they have no idea where to go or what to do, to one that annoys the player by telling them everything in minute detail. Striking a balance between these two extremes is very important for making an engaging game. Firstly, we have things like that quest marker and quest helper. The exclamation mark to indicate a quest giver, and the question mark (or chevron in DAO, or equivalent symbol in other games) to indicate an objective or waypoint for a current quest. These are a great help for players and allow them to experience the game's content a lot more simply instead of having to talk to every single person with whom they can interact. Not every player wants to talk to a town's entire population, and sometimes players might have forgotten where a particular person is located in between play sessions. 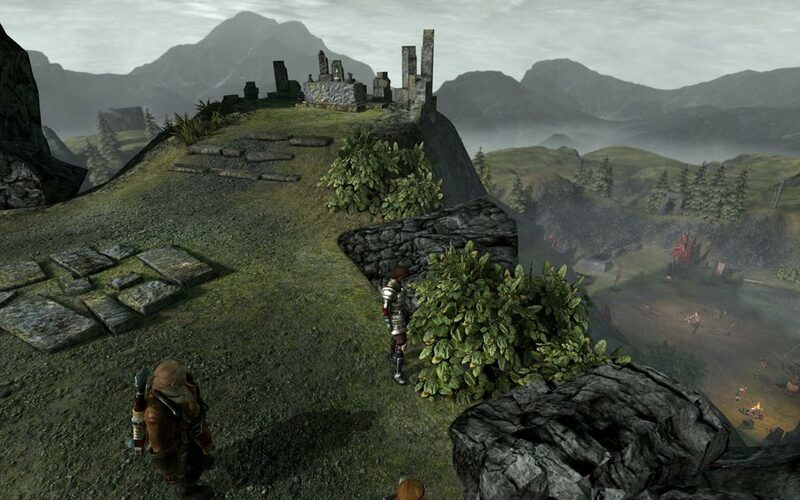 These markers assist the player in their journey, but for some they ruin the fun, removing the enjoyment they get from exploration and uncovering the gameworld on their own. In The Shattered War, I'm typically taking a middle road on this front. Quest givers will have markers, and key individuals for quests will be marked, but I'll be leaving off assist markers in most cases for quests with an exploration or investigation focus. Admittedly in Dragon Age this still often simply means that the player just holds down the "highlight all interactive objects key" (default: tab), but this still gives a better sense of exploration than running from quest marker to quest marker. Interactive objects typically warrant more interest than NPCs (the player might be able to loot them! ), especially if the player has been instructed by an NPC/quest log to search items. If I wanted to make things particularly difficult, it would be possible to only make the objects interactive (and thus able to be detected by tab) once the player got close enough to them, but this would be a sufficient break from the player's expectations that it would probably be unreasonable to do so from a design perspective. The issue is making sure that the player is given sufficient information and encouragement. 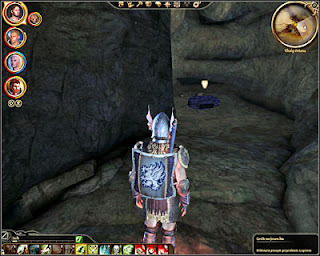 In the side quest "An Admirable Topsider" in Dragon Age, the player is told to search for three parts of a sword in the Deep Roads. However, once they have retrieved these items, they are simply told to return them to a grave, but are given no indication of where they should look for this grave. Furthermore, it is found in an area the player has already visited and cleared. 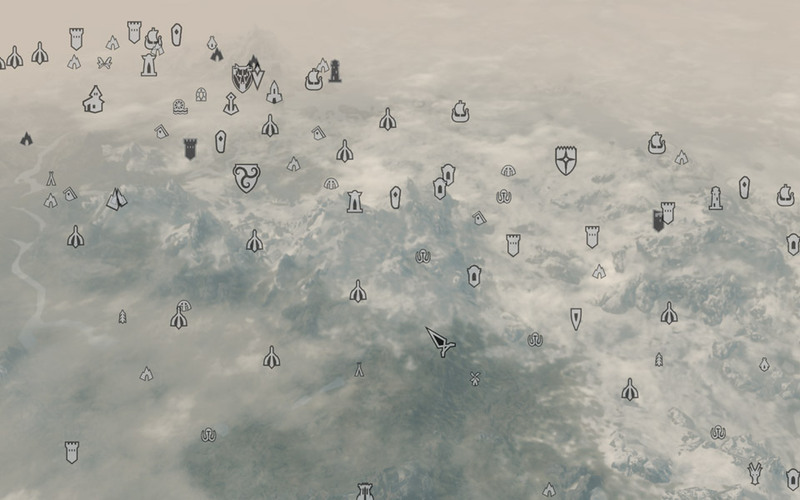 In Dragon Age, a cleared area is typically exactly that - there is nothing new to be obtained or explored. The fact that this quest breaks that expectation as set by the majority of the rest of the game means that effectively the quest helper is required in order to provide the player the appropriate level of direction required to allow them to finish the quest. It's used as a lazy means to provide the player with direction that could have been provided in a written form, which would have encouraged the player to think and explore intelligently rather than trying to search the entire map, or just looking for the map marker. This would have provided the player with a much greater sense of involvement and enjoyment because they wouldn't just be simply running from point A to point B. Surely we can give better directions than relying on these? The next issue is how explicit to be in giving the player instructions, particularly via the quest log/journel. 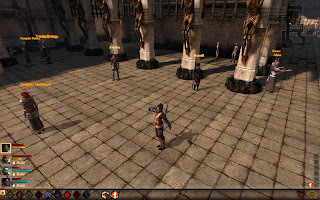 Going back to games like Baldur's Gate and Morrowind, the player's journal was a lengthy and involved thing, including personal player character commentary, frequently with additional information. It was written more as prose rather than the modern equivalent, which tends to consist of simple and clear objectives. The modern school of thought on design is that when the player looks at their quest log, they want to see two things: what they have to do, and where they have to do it. "Meet Tolfdir at Sarthal" would be a quest log entry, as opposed to something like "Tolfdir gave me a lesson today on protective wards. In conclusion he decided that a practical test of my skills and that of the other students was necessary. He suggested we travel to Sarthal to put our skills to the test, so I will need to travel there should I wish to continue my training." I'm tending towards the latter approach with my quest log entries, but still attempting to avoid unnecessary information. That said, often additional information may be accessible via additional informational codex entries rather than the quest log itself. My aim is to give players a short and succinct description of what they need to do, but without explicitly hand-holding their way through the entire experience. Players are not stupid, so don't deserve to be treated as such.